Mother of pearl is the shell of mollusks such as mussels and oysters as well as of pseudopods (such as snails), though if we were to refer to it only as "shell" we would be slighting this extraordinary creation of God. When the young of these creatures come into the world they start their struggle to live. Up to a point, they need shelter, a house, in order to preserve their tiny existence, the reason being that they have many enemies. They undertake this business with a secret God-given force, and create the walls of their housing by means of layer upon layer of inexhaustible secretions, ensuring the harmonious continued growth of its house together with itself. Let us take a look at information on this endeavour throughout history. In the Louvre Museum there are two objects belonging to the Sumerians and found in Mesopotamia representing a "wild goat entangled in branches", and a "lion struggling with a bull", also from the same provenance. The ample presence of pearl oysters in the Red Sea resulted in the working of various motifs in these shells. In addition, this type of work was also to be seen in Italy, Greece, and Cyprus. A dish consisting of geometric-shaped pieces of mother of pearl found in China and belonging to the Tang Dynasty (618-906) is evidence of the most ancient Chinese art of working in mother of pearl. It is known that mother of pearl and tortoiseshell were used in India in the 1560's. In Indian Muslim objects however, ivory is predominant, and the gate of the Taj Mahal is a beautiful example of this. Although it is not known for sure at what date mother of pearl began to be used among the Ottomans, one can arrive at a date by an examination of Koran cases, writing desks, and chests which are signed by the craftsman making them and which are dated, as well as of window and door shutters and pulpits and lecterns in works of architecture. Researchers taking this approach point to the doors of Zagnos Pasha Mosque in Balikesir and of the Mosque of Beyazid II in Edirne as being the beginning of the art of working in mother of pearl among the Ottomans. Nevertheless, in his description of the funeral ceremony of Fatih Sultan Mehmed the Conqueror, Hocazade Saadettin writes that the sarcophagus was made of pure mother of pearl. Since such an object could be made at that date, we must put the beginning of the art of working in mother of pearl among the Ottomans back to a much earlier date. Unfortunately the tomb of the Conqueror has undergone various accidents at different dates, and for this reason, the sarcophagus has failed to survive down to the present day. The first of these accidents was the "Minor Judgment Day", an earthquake which took place in 1509. The tomb also sustained damage in a major fire in 1782. Two sources have been used in works written on the history of the start of mother of pearl working: the first of these is 11. Asirda Türk Sedefçiligi ("Turkish Mother of Pearl Working in the 11th Century") by Sahabettin, and the other is Cafer Ã‡elebi's Mimar Mehmet Aga ve Risale-i Mimariye ("The Architect Mehmed Agha and a Treatise on Architecture"). Both these works make mention of workshops in 15th Century Topkapi Palace in which the art of working in mother of pearl was taught. Another locality outside the Palace which was engaged in working mother of pearl is said to have been the "Mother of Pearl Workers' Market" in the district nowadays known as Tavuk Pazari. In the first years when mosques were constructed in the city, they were referred to by name, and it is for this reason that the Mosque of Hadim Ali Pasha, built in 1497, was known as SedefÃ§iler Camisi ("Mosque of the Mother of Pearl Workers"). 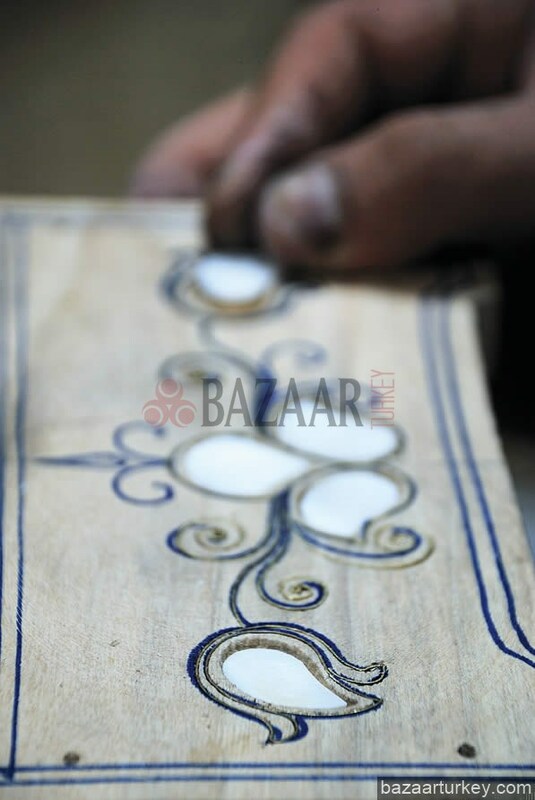 In the inlaying method, the surface which is to be decorated in mother of pearl is marked with a hard point. The grooves of thin designs to consist of wire, ivory, or bone are opened with a fine chisel and the material is set into them. The motifs whose outlines are thus drawn are carved out to a depth of two or three millimetres using gouges and prepared for the mother of pearl inlays. The use of wire in the inlaying method is known as "Damascus Work". In "Istanbul Work" on the other hand, bone or ivory is more often used rather than wire. In the gluing method, no carving takes place on the surface. Instead, the mother of pearls is made to adhere to the surface by means of auxiliary substances. In the paste method (or scattering method) mother of pearl in small pieces is made to adhere sometimes on a definite line, sometimes at random. The interstices are filled in with a paste of a colour which harmonises with the auxiliary material being used in the work. The art of mother of pearl working is a branch of the arts which is intimately involved with wood. One needs to chose one's wood according to the method of the work to be done. 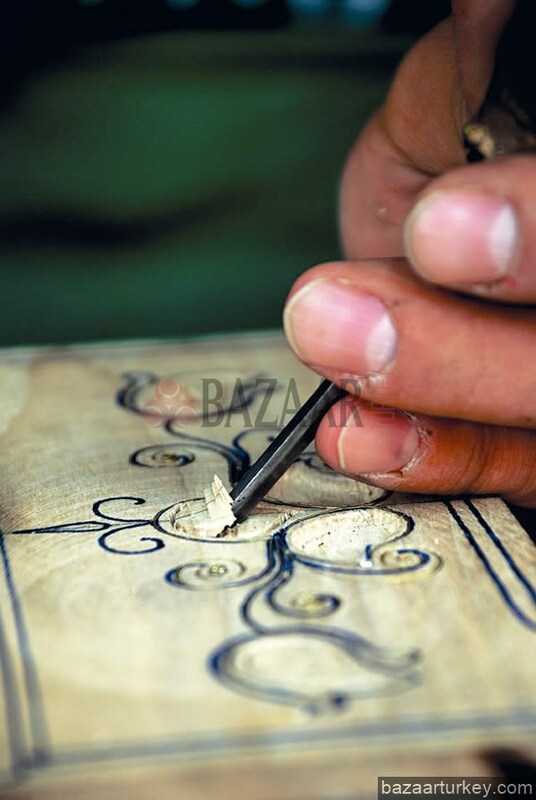 In the inlaying method, one uses walnut, which is suitable for carving and does not become brittle upon carving. In the gluing method on the other hand, the wood must be of an even-tempered nature. Linden, which is unaffected by heat or cold, and which maintains the same straightness for years -ever centuries- is the wood most suited for this technique. In the gluing technique, the surface may be covered entirely in mother of pearl, or else, auxiliary materials may be used together with it. Fillets are thin strips which are obtained by painting long narrow strips of wood or veneer in different colours. Bone and ivory may also be placed among colored veneer. Depending upon the colour of these fillets and the order the arrangement of the ivory, they may be given such names as "leavened", "rat's tooth", "row", and "puzzle". Fillets are used to distinguish designs and compositions from one another, to bind them together, and in some cases to fuse them; they occupy an important place in mother of pearl working. The manufacture of fillets is quite advanced in Damascus. Indeed, when these fillets are lined up side by side, one achieves a variety of motifs. Although Damascus work fillets are multi-colored, those used in Istanbul work have a plain appearance. The edging decorations at different angles, and which have such names as "small chain", "border", "flight", "linked", and "rim", have such beautiful examples that they appear lovelier than the whole work itself. This is actually the topmost shell of a sea tortoise. Owing to its translucent appearance, its ability to hold a high polish, and its resistance to wear, it has always been mother of pearl's closest friend. Tortoiseshell may be used in its naturel state, and similarly, it may be used with its inner surface colored. As a result of this coloring, one can obtain a dark red or golden hue. To achieve a dark red, the inner surface of the tortoiseshell is painted with a liquid obtained by mixing red lead or cinnabar with glue. To obtain a golden colour, one must use gilt leaf or else some other material which will achieve the same effect. Ivory comes from the tusks of elephants. Bone on the other hand is from the fibulae of large animals such as camels and cattle or from the ribs of water buffalos. Mother of pearl objects are named according to the techniques of their manufacture and according to the region in which they are made. In that respect, we may list the types of mother of pearl objects as follows. At the "Exhibition of Prayer Beads and Prayer Bead Making "held a short time ago by Antika, Niyazi Sayim, came up to the lectern to give a talk, and described the following event. "We were doing some work for music on the radio when Messut Cemil bent over and said into my ear; 'What you're doing is called not 'Turkish Music' but 'Istanbul Music'. Prayer beads have been known and produced in quite a few societies, but the most beautiful ones have been made in Istanbul. This is also said for our calligraphic arts, a fact which makes one proud indeed. The Holy Koran descended from Heaven at Mecca and it was recited in Egypt, but it was at Istanbul that it was written." To this, I would like to add the following: mother of pearl was born all over the world, grew, and was loved; nevertheless it was in Istanbul that it became a branch of magnificent art. Works consisting of mother of pearl, tortoiseshell, and ebony have been a source of pride for those making them, using them, and giving them as gifts. In passing from one form to another in the hand of masters, mother of pearl has assumed new names with each change, names such as "spotted", "zigzag", "camel's tooth", "lake", "dagger", cinquefoil", "carnation", "daisy", "moon", "cloud", "barley", "star", which have either risen to the sky or opened up into the fields, and stylising the most beautiful of plants and flowers, brought them into our palaces and architectural works, and even into our homes. Damascus work involves the inlay technique, and consists primarily of almond motifs. The lines around the mother of pearl which make the motifs apparent are done in wire which is an alloy of tin and lead. The mother of pearl employed is usually the mat type. In Damascus work which is done using the gluing technique, fillets are used abundantly, while mother of pearl is used extremely sparingly. As may be understood from the name, this is a type of mother of pearly work which grew up outside the Turkish tradition. A system is employed involving paste and glue among fillets of brass. Pieces of mother of pearl are made to adhere like a mosaic. The mother of pearl is iridescent green and white, while the furniture is a polished black. The presence of an abundant supply of pearl oysters in the Red Sea ensured that this art would spread throughout the region. Objects are produced from pure mother of pearl or using the gluing technique, and are given shape by carving them with sharp steel gouges. Motifs consist of stylised branches and flowers. Objects of this style include small articles such as mirror frames, models of the Mosque al-Aqsa, ashtrays, and plates.